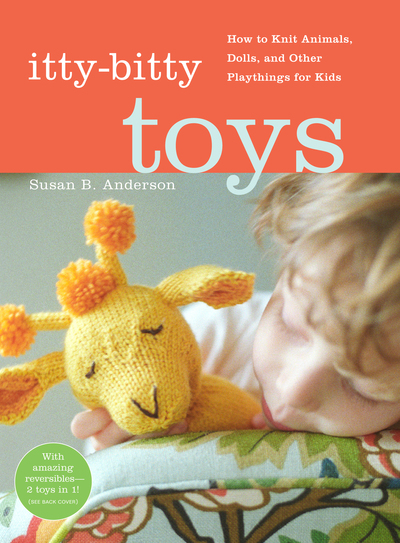 This is the most appealing and creative collection of knitting projects yet from the author of "Itty-Bitty Hats" and "Itty-Bitty Nursery". 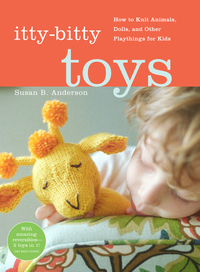 The projects range from classic and traditional fare - often presented with a fun twist - to the imaginative new ideas that Susan B. Anderson creates, including a lion that becomes an elephant and a frog that reverses into a turtle. The beginners' projects offered here are every bit as original and inspiring as the more advanced ones (easy doesn't have to be boring), and they're all presented with the same clear instructions and beautiful photographs that are a hallmark of "Itty-Bitty Toys" and "Itty-Bitty Nursery". Toddlers will be engaged by the colorful Nesting Boxes and comfy animals, while older kids will enjoy the Zebra and Panda Hand Puppets, the elaborate Princess and the Pea Set, and Felted Bouncy Balls, a felted version of a super ball that's perfect for indoor play.